The next time you take to your bicycle, be sure to take your "coach" with you. MotionLingo's ADEO® Fitness Trainer is like having a private coach in your ear and a flight recorder on your arm, giving you data on demand, including speed, elevation, pace, calories burned, and a lot of other customizable data. MotionLingo's ADEO Fitness Trainer is the first device of its kind to announce out loud statistics such as your speed, distance, time, elevation and/or calories burned. The ADEO can be used alone or connected to an MP3 player like the Apple iPod® or Dell DJ® to allow updates to be delivered right along with the music. The ADEO will turn your music down slightly to deliver an update while still playing your music. Slightly smaller than an iPod, the ADEO Fitness Companion utilizes embedded GPS technology to continuously collect workout data, which it then announces at intervals determined by the user. This enables cyclists to hear real-time workout progress reports while biking, without risk of injury or loss of focus. The user can even select from a variety of voices to suit different tastes or moods. MotionLingo's ADEO Fitness Trainer allows for safer, more meaningful, and more entertaining workouts for cyclists. Once the workout is complete, statistics can be uploaded directly to a PC or Mac by plugging the ADEO into the computer's USB port. MotionLingo's MotionTrak software, included in the package, can then be used to compare current and past workouts. Users can add workout-specific comments, graph their performance results, track mileage, and even check weather conditions from past sessions based on time and location. The software is also used to set update preferences and upload voices. An online demo of the MotionTrak software is available here. As an added benefit, users also have free access to a complete workout support system on the MotionLingo.com website, including the ability to plot an aerial view of any workout, set training goals, and monitor progress toward those goals. The site includes access to a community of cyclists who encourage each other and share their enthusiasm for the sport, as well as blogs, and user forums. For more information about the value MotionLingo's ADEO Fitness Trainer offers to cyclists, please read the review by the Sick Lines mountain biking site here. Many other online reviews of the ADEO can be found here. 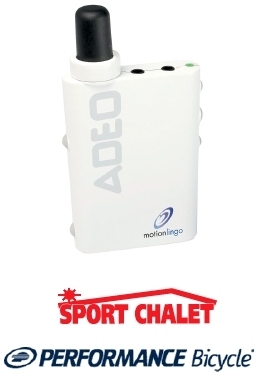 The MotionLingo ADEO retails for $149.99 and is available nationally at all Sport Chalet stores and online at Performance Bike.com as well as through www.motionlingo.com. The unit weighs only 2.1 oz and is powered by a Lithium Ion battery that can be recharged via USB port. Package contents include the MotionTrak software CD, a USB cable for connecting to a computer, an audio cable for connecting to an MP3 player, and a universal waistband for securing the unit and MP3 player to the waist. MotionLingo specializes in GPS-enabled fitness and recreation products and services designed to enhance the active lifestyle. The company's solutions include products with audible performance feedback to avoid interrupting workouts with visual data checks, and a variety of tools enabling both casual and serious athletes to enrich their workout experiences by planning, measuring, logging and comparing their sessions. The privately held company is based in Tempe, Arizona. For more information, visit www.motionlingo.com.